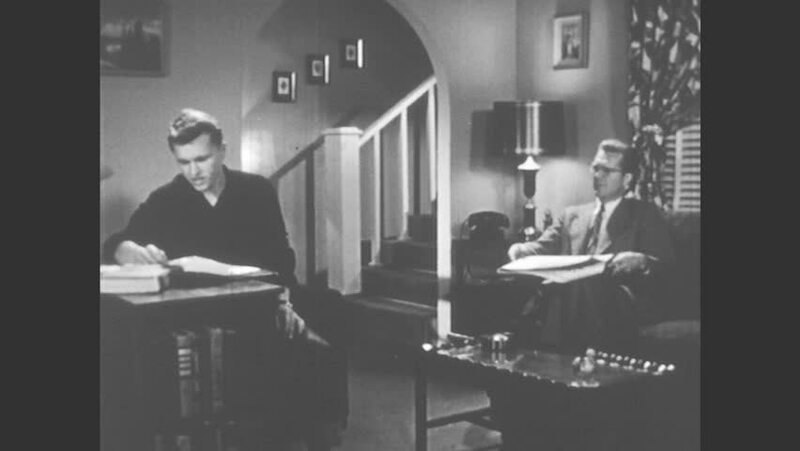 1950s: teenage boy sits at desk, closes notebook, gets up from chair, answers telephone and hides on stairs as man reads newspaper on living room sofa. hd00:191950s: teenage girl adjusts pants, picks up books, talks and leaves living room as woman puts down sewing. boy in jumpsuit sands canoe in workshop as girls wave through the window. hd00:42CIRCA 1918 - Injured soldiers are shown in hospital beds and servicemen pose at a military base in France. hd00:301950s: teenage boy sits on steps, quietly hangs up phone and sneaks up staircase as man reads newspaper on living room sofa. girl raises hand in classroom and talks to woman. hd01:19CIRCA 2010s - Troops prepare for World War one and train in aviation. hd00:271940s: Teacher talks to students in classroom, sitting around map on table. Traffic safety guidelines are written on chalkboard. Teacher points to map. hd00:201950s: Elderly woman gives eggs to man in office, exits. Man talks to woman at desk. hd00:53CIRCA 1930 - Women are seen at work inside a commercial laundry. hd00:191950s: Man talks to men seated at desk.